Polymer Solutions International is a leading provider of green products for a changing world. We recognize the benefits of reducing our dependence on nonrenewable materials and are committed to sustainability in everything we do. Built to withstand the demands of your application, our eco-friendly ProStack® reusable plastic pallets offer exceptional quality and value in retail storefronts, warehouses, shipping centers and other settings. 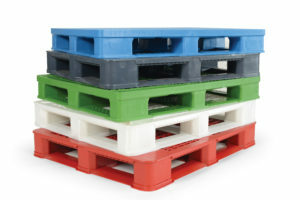 Made from recycled materials, ProStack plastic pallets are a great choice for anyone concerned about the environment, about corporate social responsibility, or simply about running a more cost-effective operation. Compared to wood, the environmental benefits of our products are clear. Our reusable plastic pallets employ a proprietary manufacturing process, in which their raw materials can be used over and over again with no loss in durability. These raw materials require minimal processing and no thermal treatment, which further reduces our carbon footprint. We offer our all clients the option of selling their old pallets back to us when they’re no longer needed. This creates a closed chain that eliminates waste while allowing us to meet consumer demand with a wide-ranging inventory of products in various sizes and configurations. Why Buy Eco-Friendly Plastic Pallets? In a competitive economy, businesses in all industries are running leaner, more cost-effective operations. Using products that make the most of raw materials is just good economic sense. Run the numbers and see for yourself why ProStack recyclable plastic pallets are the smart choice. Contact our office to speak with a representative directly. Sustainability is about more than just incorporating reusable materials. It’s about considering the full impact of a product over the course of its lifespan. This includes human factors as well as environmental. To that end, our products have been engineered to provide superior safety and hygiene. Our flame-retardant plastic pallets are free of deca-BDE and other halogens that may cause health problems with long-term exposure. We also manufacture special FDA-approved hygienic pallets for use in food, pharma and other industries. Check out our full inventory of products by continuing to browse our website. Better yet, get in touch with our head office to request a quote today.